We have a moral obligation to challenge a gun lobby callously destroying the lives of ordinary people. The recurring nightmare of mass shootings in the United States is part of a much grislier reality. In 2015, while 476 people died in mass shootings, the total number of gun deaths was 13,286. The US leads in gun deaths by a wide margin compared to other advanced nations; and yet, while, other countries have passed strong regulations to successfully contain gun deaths, our political establishment, slavishly succumbing to electoral calculus and corporate power, refuses to take action. But surprisingly, even as there are finally stirrings of a social movement challenging this status quo, a section of the Left remains indifferent to, or actively opposes, gun control legislation. Some of the objections come from the concern that implementation of such laws will be necessarily racialized. Better, therefore, to address the racist and misogynistic culture that fuels violence. Others, subscribing to notions of armed self-defense and resistance, resist the idea of disarming people. But it’s time for us to catch up with popular outrage and support robust gun control. After a massacre of children in a largely white Connecticut suburb in 2013, Obama was pressured to acknowledge gun violence in Chicago. Gun control tends to occupy prominence only following mass shootings, and these shootings have mostly victimized whites. The ensuing media discussions on gun control rarely take into account the epidemic of everyday gun violence that largely victimizes black people. Progressives casting gun control as a “white liberal” issue similarly often fail to address the fact that nationally, blacks are more than twice as likely to be killed by guns as whites, and in some states like Illinois, Massachusetts, and New Jersey, blacks are killed at a rate four times greater than that of whites in everyday gun violence. Progressives are right in highlighting the racism of the criminal justice system most glaringly manifested in police shootings of black and brown men, and they’re understandably concerned with the possibility of racialized gun control. But they tend to ignore the actuality of the state’s racialized neglect of the gun violence that disproportionately impacts communities of color. The failure of the state to safeguard black lives rarely factors into Left opposition to gun control. Progressives, focused primarily on mass shootings, highlight the fact that it’s some form of toxic bigotry that motivates most of these killings. But mass shootings constitute only a fraction of all deaths caused by guns. The conditions in which a gun culture thrives has little to do with bigotry — it is primarily shaped by gross inequalities. The violence impacting black communities is intricately connected to poverty, unemployment, lack of adequate housing, schooling, and health care. But as socialists, while we struggle against these conditions, we can’t lose sight of the necessity of gun control. Other capitalist countries, like the United Kingdom and France, with their own racist histories also have impoverished minority populations. The difference, however, is that minorities in those countries do not also have to deal with the scourge of gun violence. Again, as socialists we appreciate the violence of capitalism in denying basic necessities like decent housing and schooling to large sections of the population. But do we wait for the overthrow of capitalism and reject interim solutions to remedy those ills? Then why do some on the Left follow this path with gun control, especially, given the impact of guns on minority communities? Even when leftists lend qualified support to gun control, they limit it only to the banning of assault type weaponry. Once again, they’re focused only on mass shootings where shooters tend to use such weaponry. But it’s handguns that are responsible for the overwhelming majority of homicides. In 2013, 84 percent of black victims were killed with guns, and 73 percent of these were killed with handguns. Trayvon Martin was killed by a 9mm pistol. It is no surprise that blacks themselves do not share the Left’s skepticism on gun control. In repeated polls, more than 70 percent of black respondents support gun control, compared to some 40 percent of Whites. This puts progressives casting gun control as a “white liberal” issue in the awkward position of appearing to know better than black communities themselves what is in their interest. The argument, made by some that gun control must be opposed because the criminal justice system is irremediably racist, is untenable. It has been argued that the implementation of laws governing sexual assault and domestic abuse are often racialized. Yet few make the case that the state should therefore no longer criminalize sexual assault. The anti-gun-control position assumes that because the racism of the criminal justice system is immutable, it trumps all possible gains of gun legislation. But if its advocates wouldn’t make the same argument about homicide, sexual assault, robbery, etc., the argument is inconsistent. If in the cases of those laws, the answer is to challenge racist implementation, rather than the laws themselves, the same holds true for gun control laws. Given the history of racialized policing, the call for unarmed police, especially for police on patrol, is certainly one progressives should push. Countries like the United Kingdom, Norway, and New Zealand offer successful instances of the practice. Linking this demand to a wider call for gun control is one way to get it into popular consciousness. Guns don’t kill people, as the old gun-advocate adage goes, people kill people. Progressives opposed to gun legislation only slightly modify that idea and claim that it’s not guns but bigotry that kills people. There is of course an obvious truth to the claim — a capitalist and imperialist state breeds a violent civic culture. But the fact remains that without the assault rifle used by the Orlando shooter, for instance, there was little damage he could do with his homophobic views. Bigoted and alienated people without guns do not conduct shootings. 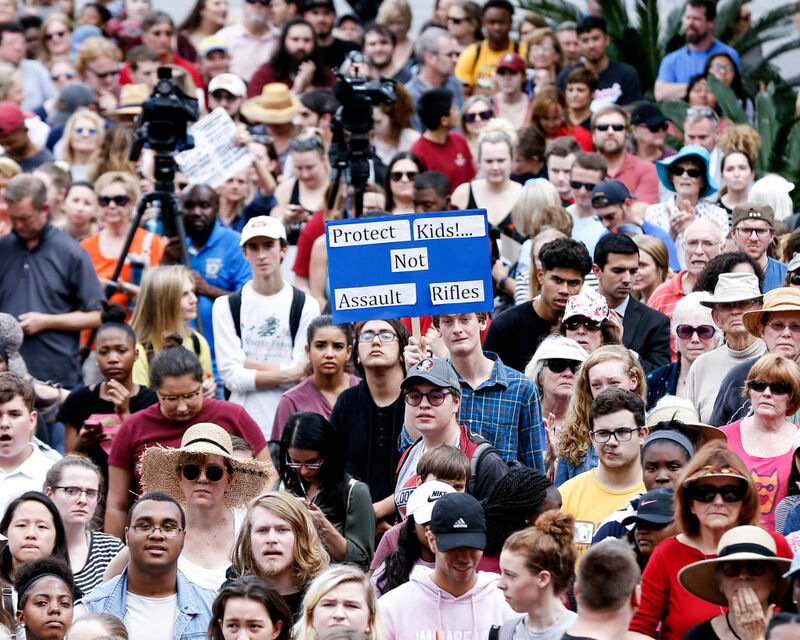 The students marching across the country clearly see the link between the political influence of the National Rifles Association (NRA) and mass killings. In remaining ambivalent towards gun legislation, progressives shift their target from the NRA to what they believe are the root cause that fuels violence like racism and capitalism. But doesn’t the NRA, with its racist politics and its corporate hold over the political establishment, represent precisely such root causes? Political protests typically erupt against an immediate offending entity — it could be a police precinct or a health care company. But just as these entities are manifestation of larger social forces, so is the NRA. While socialists may lose sight of the NRA in their focus on root causes, the NRA knows how to recognize the enemy. In a speech after the Parkland shooting, the NRA CEO, Wayne LaPierre repeatedly issued warnings of a tidal wave of socialists and a “socialist agenda” of stripping firearms from citizens. There is a recurring theme in social media about the double standard of the media in according sympathetic coverage to the anti-gun student protestors compared to the negative attention to the Black Lives Matter protests that highlighted racist state violence. While the observation is correct, it does not amount to a critique of the student protests. Confronted with a failure of the state in providing them basic safety, students took to the streets. They may not be protesting institutional racism or capitalism but they grew up in an era when the country saw more of those protests then it did in the prior four decades. Compared to their parents, the generation is much more liberal on questions of oppression and discrimination, and there is every reason to believe these protests will radicalize many of them. Instead of bemoaning the media attention accorded to the protesters, progressive critics should come out in wholehearted support. At the core of left ambivalence about gun control are notions of armed defense against a militarized state. The Left draws on a history of such pockets of resistance in struggles against colonialism and fascism. But here’s the thing. Whatever the successes of such resistance in prior regimes, because of today’s capitalist state’s overwhelming superiority in the scale of violence it can perpetrate, ideas of armed resistance are both untethered to ground realities and actively counterproductive. The notion that today a civilian armory can hold its own against the military might of the state is absurd. And such romanticized notions, unchecked, can cause a lot of harm. Imagine the state response if Occupy or Black Lives Matter included the idea of armed defense or resistance. And also imagine what it would have done for the future of organizing. There’s a reason the carceral state is happy to promote the proliferation of arms among its citizenry. It knows that such proliferation poses no threat to its rule. But there’s a deeper more insidious logic at play beyond pandering to gun manufacturers. A gun culture builds the specter of perpetual threat, thereby heightening the atomization and alienation of ordinary people in a capitalist society. The false sense of security offered by guns only serves to further disempower people by undercutting collective trust and community strength. Guns have a terrible record in the face of actual threats. They provide succor to an alienated culture. And the state will not only crush the first sign of any real threat from armed resistance but will also become much more draconian in dealing with any organized resistance. The Left needs to abandon its reliance on the imagined power of guns, and focus on what does build alternative sources of power. The only way to fight against the capitalist order is patient, ground-level organizing in our organizations, our unions, our community forums, and when possible, in the electoral arena. What we need are not isolated armories but the mobilization of the masses. And joining with powerful student protestors and millions of people finding their voices against gun manufacturers and the NRA will help with that work. Guns in the United States pose a real threat to public health and safety and disproportionately impact communities of color. Their preponderance only serves corporate interests, a corrupt political establishment, and an alienated capitalist culture. We have a moral obligation to challenge a regime callously destroying the lives of ordinary people. Nivedita Majumdar is an associate professor of English at John Jay College. She is the secretary of the Professional Staff Congress, the CUNY faculty and staff union.